As a military brat, Kellie has moved from place to place, including the tiny islands of the Azores. After moving away to Kansas for college, Kellie finally thought she had escaped the risk of island life again. She was in for a big surprise when her husband enlisted in the Air Force and was sent to – you guessed it – an island. 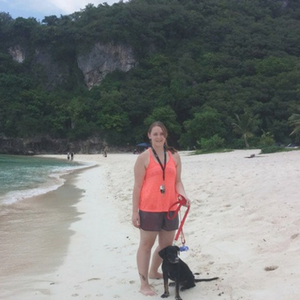 Kellie moved to Guam in 2014 with just her husband and crazy cat. They now have, in Guam tradition, two boonie dogs and three chickens. About a month after moving to Guam, Kellie found out she was pregnant. She had her wonderful son thousands of miles away from family, but her son follows in her family tradition of having an overseas birth certificate. Originally from the south, moving to an island against her will was a very tall mountain to conquer. With no country music and Chik-Fil-A, Kellie thought she was surely going to lose her mind. Luckily, she met some amazing friends who helped her cope with the culture shock and adjust to life on a rock. Kellie is currently finishing her associate degree in journalism with hopes of one day finishing her bachelors degree in entrepreneurship. Before she moved to Guam, she was pursuing her business degree but put it on hold once she had her son. With jobs being difficult to come by, she turned her passion of writing into a way to earn extra income. It turned out that she has a knack for writing, so she now works as a freelance writer for a variety of companies. Once she finishes her journalism degree, she hopes to write for a newspaper. Her ultimate goal in life is to open a petting zoo/rabbit sanctuary. Although their time here is only temporary, it is an experience she and her family will never forget.